Instead of chocolate eggs maybe a basket full of colourful macarons would be nice. Taken through a window when the store was closed unfortunately. 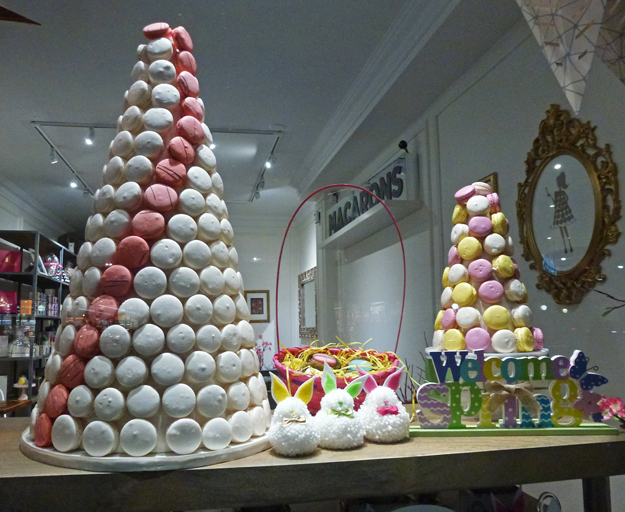 Hello, what a pretty display of eggs and macaroons. Happy Easter to you and your family. Happy Thursday, enjoy your day! Really 'sweet' Easter treat idea! Sounds good to me although, so does chocolate eggs! Oh my, there goes my sweet tooth again. Oh, how sweet it is. And, yes I would love to have one, two, or a dozen of these. Have a Happy Easter. Macarons are one of my favorites! They look so pretty. Wow, they look good !!! Very nice, I especially like the cute bunnies. I hope you had a marvelous Easter! Ooooh, nice. A lovely pile of macarons. I came across a macaron store recently in Naples and bought some. They were so disappointing. I'd love a macaron basket, they come in some amazing flavours! !